In Japanese cuisine, there is a sushi experience known as ‘omakase’ that embodies the pinnacle of culinary freedom and creativity. Derived from the root ‘makasu’ which means “to entrust”, the chef is afforded the opportunity to showcase the very best of his or her abilities. 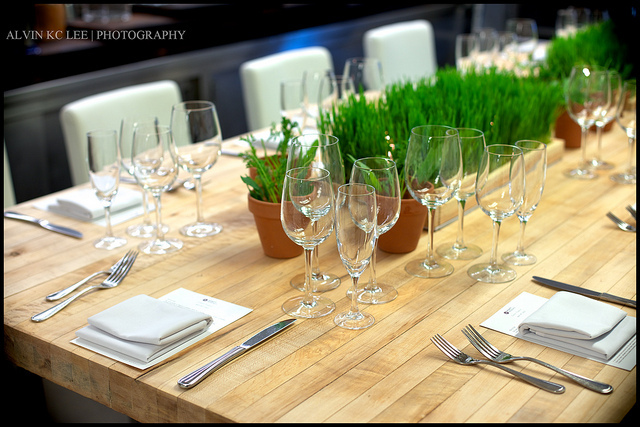 In Western cuisine, there is a parallel concept known simply as a chef’s table invitational. With no obligation to adhere to a standard menu or use common ingredients, the dining experience at a chef’s table is limited only by the vision and skill of the head chef. 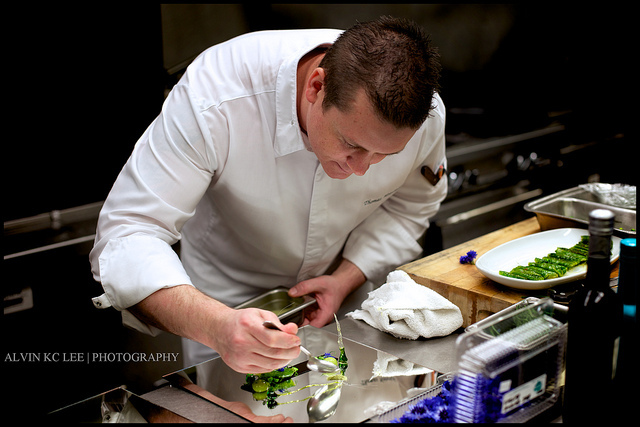 Last week, I was invited to attend an exclusive chef’s table dinner at the Hyatt Regency Vancouver with Executive Chef Thomas Heinrich. Well known for his phenomenal artistry and visually stunning dishes, I went into this chef’s table dinner with vaunted expectations. From previous visits to MOSAIC Bar & Grille (here and here), I had already been partially oriented to Chef Thomas’ fierce passion for food. That said, I recognized that he operates under the same creative and logistical fetters that any chef does in the public domain. For this one special evening, those restraints were removed and we were treated to dish after dish of limitless possibility. To preface the dish by dish commentary below, none of the 10 dishes we were served are part of the regular MOSAIC menu. That said, I still wanted to publish this article to highlight what a talented chef can do in a chef’s table context. To start the dinner off, we were served a uniquely plated offering of fresh oysters with pickled onions in an Escabeche foam. As a starter, this small tin was little more than a satisfying gulp but refreshingly primed the palate for what was to come. 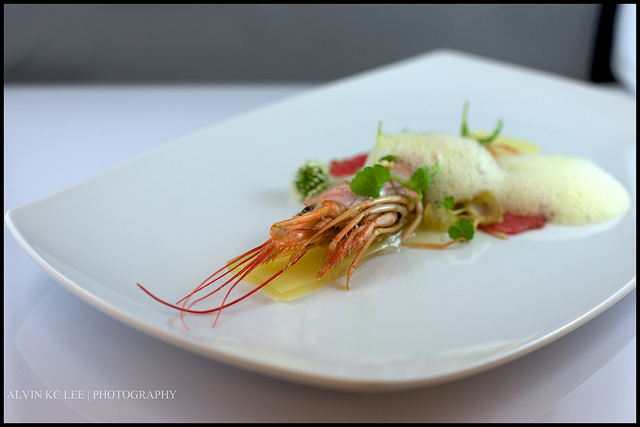 The next dish was a beautiful Argentinian Red Shrimp set on raw Wagyu Beef and Kalamansi Gelée. What I loved most about this dish was the seamless marriage of Spanish preparation and Japanese influence. The famous shrimp from Barcelona were flash boiled perfectly with the head allowed to partially cook just before service. Crowning the dish were three forms of wasabi: wasabi chips, wasabi foam and freshly grated wasabi root. It was interesting to note that while the wasabi root was kept quite potent, the chips and foam were tempered so not to overwhelm our palates. I enjoyed both the flavours and textures of this dish very much. As a photographer, this next dish was my favourite for the evening based purely on aesthetic. 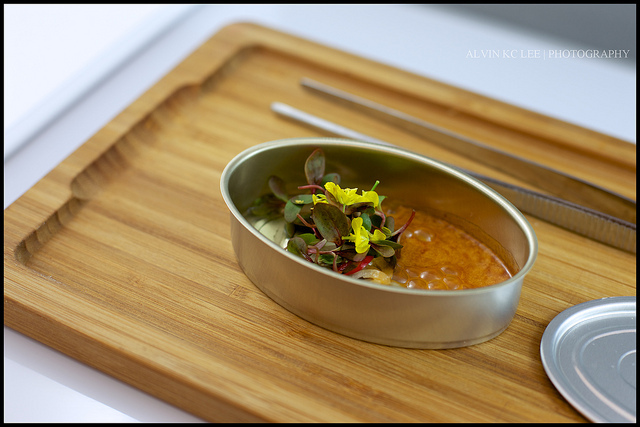 Served on a mirrored surface, the dish was initiated by a wide brush stroke of Black Garlic Purée which is a fermented garlic from China. 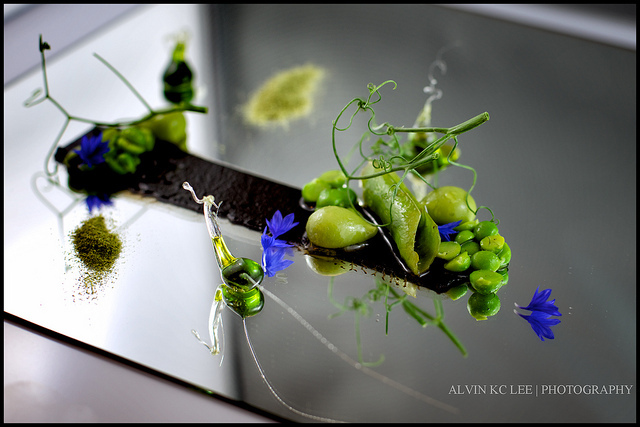 Artfully placed around the plate were freshly chucked peas that had been lightly tossed, peas in the pod, skinless pea ravioli. pea tendrils, isomalt encapsulated pea oil and pea powder. As much as I thought I knew about peas, this dish was an entirely new level of education as to how peas can be used. In addition to being breath-taking to look at, this dish contained a staggering level of thought and skill to execute which commands respect. On my previous two visits to MOSAIC, it was no coincidence that my favourite dish at both meals was a fish dish. When I saw that the next course contained a gorgeous seared filet of halibut, my eyes lit up. Amusingly, the star of this dish was artichokes in the form of artichoke relish, confit and a purée that was sandwiched in a coconut and squid ink macaron. First off, the squid ink macaron was a delight to eat. Chef Thomas jokingly referred to it as an Oreo but it was definitely far more refined than that. 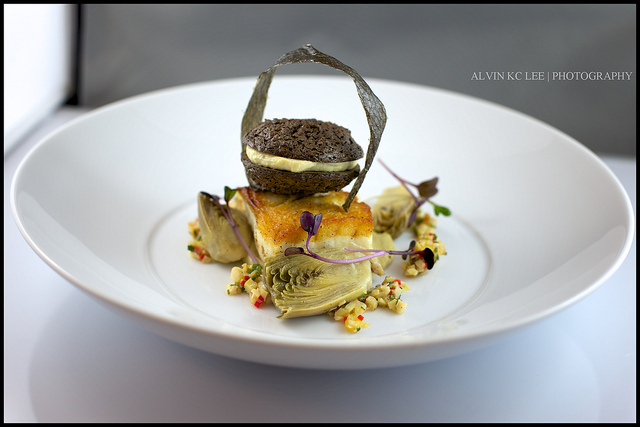 As expected, the halibut was cooked beautifully and complimented the assorted forms of artichoke very well. There is a famous saying that goes something like “There are two types of people in this world: 1) Those that love bacon and 2) Those that lie about not loving bacon.” For bacon lovers, this dish is definitely a dream come true. Dominating the plate are two pieces of Skuna Bay Salmon wrapped in nicely crisped pieces of bacon. 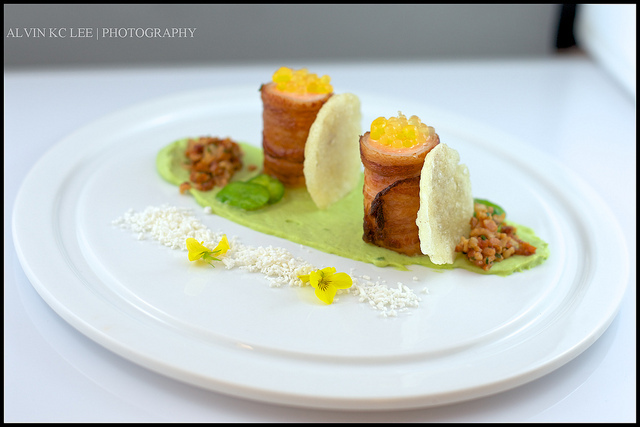 Topped with citrus caviar, the two cleverly disguised pieces of fish are supported nicely by a fava bean purée, bacon relish and bacon fat powder. For me, the two pieces of Skuna Bay Salmon were simply sublime. The plating for this dish was cheeky yet elegant and the saltiness of the bacon forms were steadied nicely by the salmon. This next dish was just spectacular in both simplicity and profile. 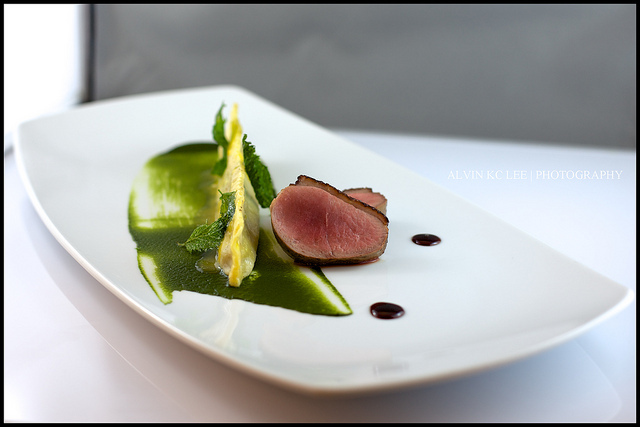 Contrasting the Duck Confit Ravioli and Apple-Brined Duck was a royal green stinging nettle purée. Stinging nettle crispy leaves garnished the long dumpling while a Maple Vanilla gastrique kissed the duck meat. I don’t eat duck meat all that often so this dish definitely was quite luxurious for me. The richness of the duck meat was again reflected in the long ravioli which I really enjoyed. Although the portions may seem small in my photos, each dish was actually quite substantial when evaluated as a 10 course meal. For me, this dish was perfect in terms of presentation and consumption. 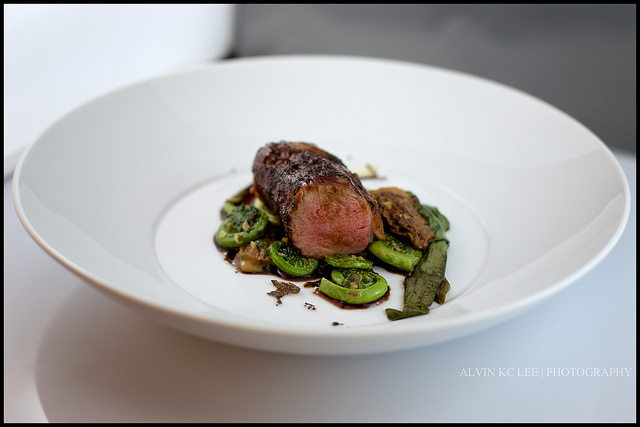 The eighth and final dish before dessert was a roll cut piece of Australian Lamb Tenderloin with fiddlehead ferns, pickled ramps and morels with black truffle. Coming right off the richness of the duck dish, this lamb offering definitely was more coarsely hearty in comparison. For me, the cut of lamb was a bit rugged but still quite pleasant to eat. At this point in the meal, it was no surprise that most of us were quite full but it was still a pleasure to see what Chef Thomas could do with red meat. Both meat dishes were perfectly prepared and moist while retaining their natural base flavours. For dessert, we were treated to two beautiful dishes. 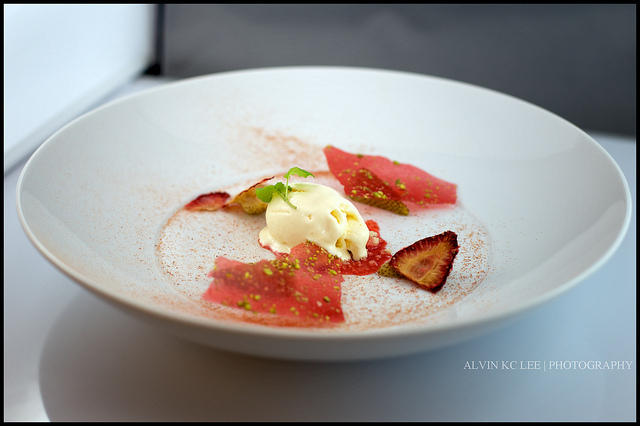 First up was a varied assortment of strawberries prepared in several different ways. Our plates were comprised of green strawberries macerated in honey, strawberry chips, pistachio-strawberry glass and a small scoop of cardamom-sour ice cream. Rounding out the plate was some strawberry and vanilla streusel and strawberry butter. We are so conditioned to eating strawberries traditionally that it definitely was a positive shock to our senses to see how versatile this fruit can be. Seeing it prepared in such dynamically different forms was not only delicious but educational as well. The tenth and final dish was an indulgent concoction of chocolate and blood orange. 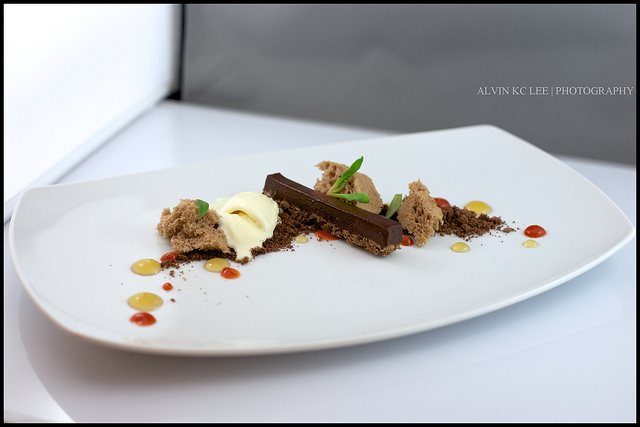 Balanced delicately across the length of our plates was a grouping made up of a chocolate fondant bar with blood orange flavour, a 30 second chocolate cake, chocolate streusel and white chocolate ice cream. Although the dish looked visually busy, all the components went together so well for a sweet dessert with clear fruity undertones. As they say, chocolate is always the perfect end to any evening and this was certainly true of this dessert. 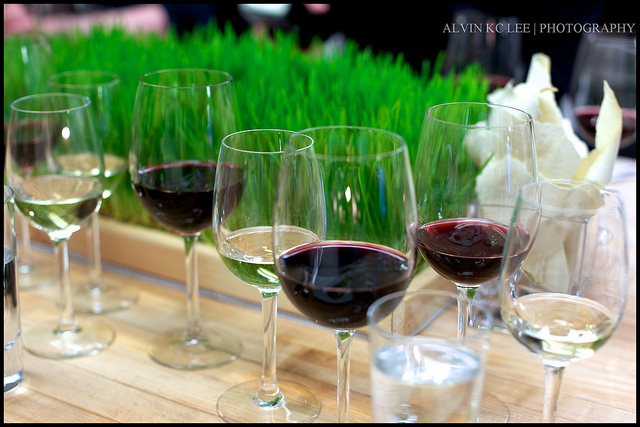 This write-up has gotten a little longer than I had originally intended but I did want to quickly list the beautiful wines that were paired with our dishes. A big thank you to Hyatt’s Director of Food & Beverages, Mr. Michael Halloran, for his time and efforts in finding these perfect wines for us to enjoy along with our food. The list is presented linearly with a couple of the wines pairing with multiple dishes in case you are interested in looking into any of them. My two favourites actually turned out to be the two dessert wine pairings at the bottom, especially the Essencia. To wrap up, one final thank you to Executive Chef Thomas Heinrich, Mr. Michael Halloran and the Hyatt Regency Vancouver for the extremely generous dinner invitation. A big thank you to Sherman Chan from ShermansFoodAdventures.com and Diana Chan from Foodology.ca for helping me with the dish composition commentary. This was a phenomenal evening of food and wine none of us will soon forget. Cheers!